I was asked to be a part of the designer challenge for the Christmas issue of Fat Quarterly. I was given a small stack of Winterkist by Monica Solorio-Snow and asked to design a pattern with it. 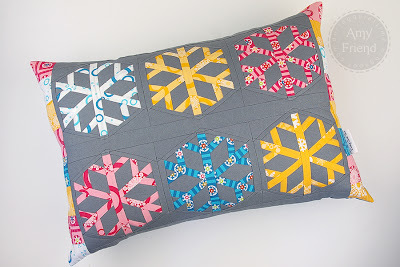 I decided to go with the snowflake theme seen in so many of the prints and designed a snowflake paper pieced block. I made up six of them and set them on a Charcoal Essex background with a patchwork border and gnome backing. If you’d like the pattern, it’s available in the Fat Quarterly Christmas Issue. Enjoy! I’ll be back tomorrow with Halloween costume pictures!